Showing 20 articles from July 29, 2014. Photo Courtesy Mike Tully Karlee Freeman posed with her gold medal at the National Junior Olympics last Saturday, July 26, after placing first in the discus with a throw of 130’10.75”. 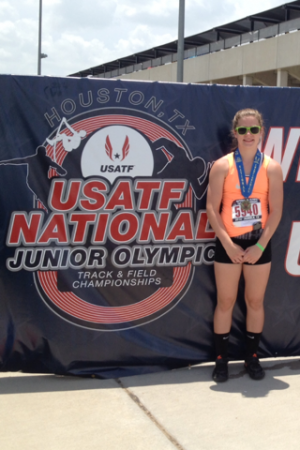 Karlee Freeman of Raymond Jr/Sr High School placed first in the discus at the National Junior Olympics last weekend in Humble, Texas, throwing 130’ 10.75”. Castle Rock gearing up for Speed Week this Wed.-Sat. The Mt. St. Helens Motorcycle Club will be hosting Speed Week at the Castle Rock Race Park this Wednesday through Saturday, culminating in an AMA Grand National TT race. Featuring events for spectators and riders alike, this event is expected to bring more than 10,000 people from across the country into town and will feature multiple races throughout the week. Vader will be hosting its annual City-Wide Yard Sale this Saturday and residents who wish to take part in the sale may still do so. Made up of dozens of residents holding their own yard sales on the same day, participation is on an at-will basis, and last year’s participants took home an average of $100 apiece in sales. Shopping is expected to begin at 8 a.m., and the Vader Park Board will make a showing with hotdogs for sale. An exchange between a school in Germany and Toledo and Onalaska schools came true for nine THS students last month. The trip was a dream come true for many of the students, who had their first significant travel experience. THS German language teacher Horst Malunat said that the program is amazing for the kids and what is even better is students from Germany will come to visit and attend classes in Toledo and Onalaska this fall. The Toledo New Life Assembly added even more family games and activities during their third annual SummerFest this last Saturday in Toledo, including a two-person log-cutting contest. A car show novice won top honors during this year’s Rod Run to the Rock on Saturday in Castle Rock. Longview resident Willis Kilthew won the Pepper’s 49ers-sponsored Best in Show trophy for his 1965 Chevrolet Chavelle, which he had acquired just last year and represented his first entry into a car show. Local anglers upped the ante at the Toledo Steelhead Derby last Saturday with winning catches weighing in at more than, or close to, 10 lbs each. While still trailing behind the derby record of 15 lbs caught in 2012, this year’s winner was a 10 lb 13.5 oz steelhead caught by Ty Birdwell, followed by a 10 lb 5.5 oz steelhead caught by Katrina Buswell and a 9 lb 9 oz steelhead caught by Michael O’Neal. Each received a cash prize of $300, $200 and $100, respectively, while Birdwell also received a commemorative trophy carved and donated by members of the Cowlitz Indian Tribe. Mt. Mania Fun Run organizer Dave Vorse was honored for having spent 20 years putting the race together during the annual event last Saturday in Castle Rock. Noted for having spent two decades officiating the race as a part of Cowlitz Valley Runners (CVR) and never being able to compete himself, Vorse was presented with a commemorative t-shirt, jacket and medal naming him “Mountain Master” by brother and fellow CVR member Mike Vorse after awards were given for those who finished the race. Here we are at the end of one month and the beginning of another. And that means: the monthly Town Breakfast will be this Saturday from 8-10 a.m. There isn’t a better selection of “good eats” anywhere around! Pancakes, eggs cooked to order, ham OR sausage, biscuits and gravy – all at reasonable prices with orange juice and bottomless coffee included. Toledo Senior Center's Sept. 9 Chair Yoga class filled before last week's column hit the stands! More great classes available. Contact Diana, diana.haug@lewiscountywa.gov or (360) 864-2112. Tickets on sale for the Toledo Lioness Afternoon Tea 2 p.m. Oct. 5 at Toledo Senior Center, $10 through any Lioness Club member or Phillips Insurance. Contact Rachel, rachel@phillippsins.com or (360) 864-8844. These sell out fast. City Hall has announced the hiring of a new sewer/water employee after having spent the last several months depending on Winlock to oversee such services. Part-time employee Terresa Yost, who also works for the City of Pe Ell, began July 14 at a rate of $19.50, and is expected to keep Vader’s lagoon system up and running. If you happen to run into her, be sure to welcome Mrs. Yost to the community. City Landscaping – The City of Toledo removed the soil that was growing weeds around the fish sculpture and recycled that dirt to fill the five black culvert boxes at the boat launch parking area. The culverts were then wrapped in wood logs and a tree planted in each. The Toledo Community Library should be up and running by mid-August. The hours will be Wednesdays from 10am to 7pm, Thursdays from 10am to 5pm, and Saturdays from 10am to 2pm. The Winlock School District is accepting donations of school supplies for their Stuff the Bus program, which will run officially Aug. 25 through 29, but donations are being accepted at the district office right now. For more info on this unique and beneficial fundraiser, call the district at (360) 785-3582. Don’t forget the district is also offering free breakfast and lunch now through Aug. 14 to local students. Free breakfast and lunch are available to children 18 years of age and younger at the Winlock Miller Elementary School cafeteria between 8 and 8:30 a.m., and 12 and 12:30 p.m., respectively. Ballots for the Primary Election are due Tuesday, Aug. 5, so don’t forget to turn yours in on time. A Castle Rock man was booked on multiple charges related to a protection order violation in Vader Saturday, according to the Lewis County Sheriff’s Office. Andrew K. Wheeler, 30, was contacted on the 1100 block of SR 506 walking along the railroad tracks with his 28-year-old girlfriend, of Vader, who has a no-contact order against Wheeler. Authorities are seeking help to locate a suspect involved in a burglary in Chehalis in May. On May 9 at the Chehalis Walmart at around 1 a.m., an individual described as a heavy-set, balding male approached the jewelry section, broke the display case with an unknown tool and stole 17 assorted rings before leaving the store in a dark-colored coupe. The estimated loss from the burglary is $4,224. In these extremely challenging weather conditions, State Fire Marshal Chuck Duffy is urging residents to inspect and maintain the defensible space around their homes. Defensible space can dramatically increase your home’s chances of surviving a disastrous wildfire, and can be accomplished through careful planning and vegetation management. “Wildfire dangers have increased statewide, making the need for fire safety a key concern. Flying embers can destroy homes up to a mile ahead of a wildfire,” cautions, Duffy. For that reason, creating and maintaining a defensible space of 100 feet around your home is essential for limiting the amount of flammable vegetation and materials that may surround your home. Commissioners with Cowlitz County Fire District 6 have approved an EMS levy proposal of $1 per $1,000 of accessed property value to be considered during the Nov. 4 General Election. Said to be the first such levy proposed to the district, based in Castle Rock, officials say revenue from the levy would help firefighters and EMS staff afford more than just the basic costs of running the agency and avoid a scenario in which an unexpected expense could bankrupt the district. Local fire and EMS calls between July 21 and 27. Castle Rock held its third annual Bloomin' Tour last weekend with a growing number of local venues taking part in the event. Begun in 2012 by gardening trio Nancy Chennault, Theresa Bergman and Bill Davis, Bloomin' Tour was started as a way to promote agri-tourism among the many growers of flowers, fruits, trees, shrubs and other products, with the number of participants continuing to increase.